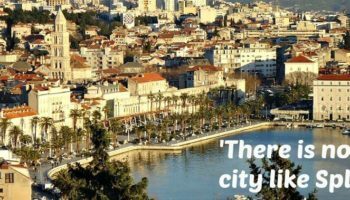 Most people visiting Croatia have no idea that Split is actually more than just a transit hub to one of the Dalmatian islands. Split itself has some really amazing beaches that you will fall in love with instantly. And we’re going to talk about the best beaches in Split, Croatia in today’s article! Most of these great beaches are actually located in the residential parts of the city, so if you’re planning to actually relocate to Split – live there or visit for a while, choosing an AirBnb or any sort of accommodation in these residential areas will come with the bonus of having the beaches nearby. And that’s a huge bonus in my opinion! But let’s not waste any time and let’s check the most amazing beaches you can find in Split! The above map shows a layout of the beaches in Split, divided in three main areas. In the Western part of the Split port there are less frequented and less crowded beaches located on both sides of Marjan hill, the symbol of Split. Strolling away from Bacvice beach, just 5 minutes away (walking! ), you will find more beaches like Ovcice beach, a small pebble beach with a playground for children. Walk for 5 more minutes and there is another sandy beach named Firule, a popular family friendly sandy beach with shallow sea. Because of its fine sand and natural shelter, Firule has always been popular among families with younger children – so if you visit with your kids, they’ll most likely make some friends there too! Going South-East from Bacvice beach, following the D8 road (also called Jadranska magistrala – the Adriatic coastal road), on an area of around 10 kilometers, there are numerous beaches (sandy, gravel, rocky) which extend one after another all the way to the Podstrana Riviera (more about this below). Although these beaches are not extremely spectacular, they offer some great views and are not always crowded, so you can truly relax and enjoy Croatia. I consider Podstrana the most appropriate small Riviera for couples and families with children and it’s just a few steps away from Split. Podstrana is a small settlement only 7 km South of Split, hosting several gravel beaches with good access to the sea. The beaches in Podstrana stretch over 6 km with many small family hotels and apartments nearby, covering all price ranges and offering, overall, good service at decent prices. You can check out the hotels in Podstrana here and book your stay today. This small Riviera becomes more crowded during the high season (July and August) when Split itself becomes an overcrowded bee hive. However, Podstrana is not that bad and you can still find some quieter places and beaches where you will actually get the chance to look at the sea and not other tourist’s back. Even if you don’t travel to Croatia by car, you will still find it extremely accessible to visit any of the beaches in Podstrana since there are are plenty of daily buses leaving from Split. On the other hand, if you decide to stay in one of Podstrana hotels and you’re traveling by car, take my advice, leave your car in Podstrana and take the bus into Split in order to avoid the parking jams and get there faster. Znjan beach is about 3 km away from the Split harbor, located under the Promenade of Pope John Paul II and it is easily reachable by local bus line N° 8. Take this bus from the Trznica (Green Market opposite Silver Gate) bus stop. It runs 2-3 times per hour from 5:30 to 22:30 each day. Bene – a stone beach on the north side of Marjan. Accessible by public transport (car only with a special pass – so make sure you leave your car behind!). Kasjuni – stone and gravel beaches on the South side of Marjan Hill. Car access is possible. Also, this is a dog friendly beach. Kastelet – pebble beach on the South side, also a popular romantic place. Car access is possible. Jezinac beach – located in Meje, an elite part of Split city, only 2 miles from the old Split center. Most of Split beaches are reachable on foot but also by public bus service. Marjan beaches are easily reachable by Line N° 12 and Line N° 21 from the St. Frane (Saint Francis) bus stop on the west end of the Riva promenade waterfront. Bus 21 has a stop at the entrance of Kasjuni beach. Bene beach is the last stop on bus N° 21 line. You can find out additional information about the buses and their schedule on the Promet Split website which also has an English language version and is relatively easy to operate if you know what you’re looking for. But if you’re in trouble at any given moment, don’t hesitate to ask the locals as everybody knows the lines going to the beaches! And this would be it! I’m sure you didn’t know that there were so many beautiful beaches in Split and most of them are true must visit beaches. So take advantage of your time spent in the area and check out as many as possible!